Fox has bundled together the three Omen feature films, about the rebirth and rise to power of the anti-Christ, in a very nice, limited edition 25th Anniversary slipcase edition, for a pretty reasonable £35 or so. The new 2.35:1 anamorphic widescreen transfers will be an eye-opener for fans used to seeing the films butchered on TV, or on VHS. The first disc is, deservedly, a loaded special edition, replete with more than an hour’s worth of recent interview footage, including a lengthy look at Jerry Goldsmith’s Oscar winning score. Each film also has a commentary track by the director or producer, and there are trailers for all three movies. The sound is Dolby Surround 2.0 mix at 192kbps. The first film is also available separately. 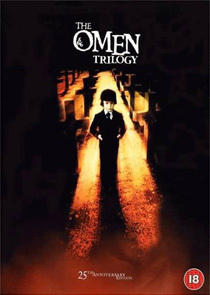 The Region 1 version of The Omen features the film’s original mono soundtrack as an option, but otherwise the discs are practically identical. The US box set also includes the fourth film in the “Trilogy”, the dire 1991 TV movie Omen IV: The Awakening.